Porch Swing Creations: 1st Anniversary Blog Candy! Today marks my first full year as a blogger! I can't believe how fast a year can fly by! I've learned so much over the course of a year; and I know I've just scratched the surface. I hope you've enjoyed the journey with me as much as I have had creating it for you! 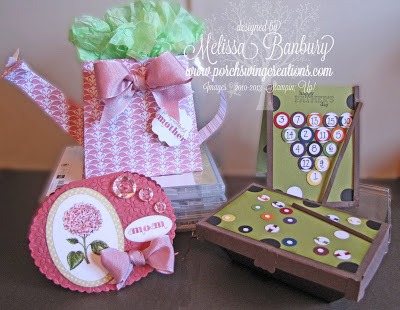 I've been so blessed to be able to connect with other's all over the world; and to think its all because I'm simply sharing what I love - the art of paper crafting using Stampin' Up! products! As a thank you for all your support I'd like to give away my very first Blog Candy - a complimentary copy of my May Virtual Online Club Tutorial to one reader! If you'd like a chance to win, please leave a comment below - I'll be using a random draw generator to choose a winner which will be announced on Monday May 13th. Hi! Congratulations! Your blog is great! I love the colors and the cards are beautiful! A Blog Candy, how fun! Thank you for sharing. I subscribed to your blog within the last year but would not have guessed you were kinda new at it. I have enjoyed everything so much, beautiful projects and cards! Thanks for a chance to win such fun blog candy! Congrats on your blog! I enjoy seeing your creations, thanks for sharing. Congratulations and many thanks for sharing your awesome creativity. Look forward to another fun year! Blog candy the icing on the cake. Thank you! I loved your Northern lights and became a follower of your blog. I love how wonderful you made the little Best of Best stamp look on your card. interesting that they released this as a smaller version! And you have made it look marvelous! Very cute billiards table! How fun! Congrats on your blog! Off to peruse even more of it again. I have really enjoyed seeing all your work, especially the sponging and the northern lights tutorial. Your projects look great and love that their is something for either male or female thanks for the chance to win this amazing tutorial. I would love to win this blog candy always inspired by all stampers and creators out there everyone has such a different take on ideas!! Congratulations on your first anniversary. I stumbled upon you via Pinterest, I believe, and became a subscriber about three months ago. I love your work and your blog. Very inspirational. Thank you for the chance to win some blog candy.